Honestly, I don’t know how to start a thread like this without jumbling words and forming run-on sentences, but I’m going to attempt to jot down some thoughts (pull yourself together, Dan!). Right out with it… I’m moving on from EA and Battlefield. My last day with the team will be this Friday, February 8th, but will be answering questions and DMs relating to Battlefield until the end of the month. My trusted Community Manager colleagues, Ben Walke and Jeff Braddock are carrying the Battlefield Community torch and are highly qualified to do so! Please do hit them up if you have any Battlefield related questions. Now for the emotional side of it all. I’ve already a significant amount of nostalgia hitting as I look back on my early days at EA and Battlefield. I’ve also an immense amount of pride for the accomplishments we as a community carry today. The person I am professionally and personally has been shaped from the incredible achievements and challenges we’ve overcome as a tight knit gaming family – I honestly wouldn’t be who I am without you all. 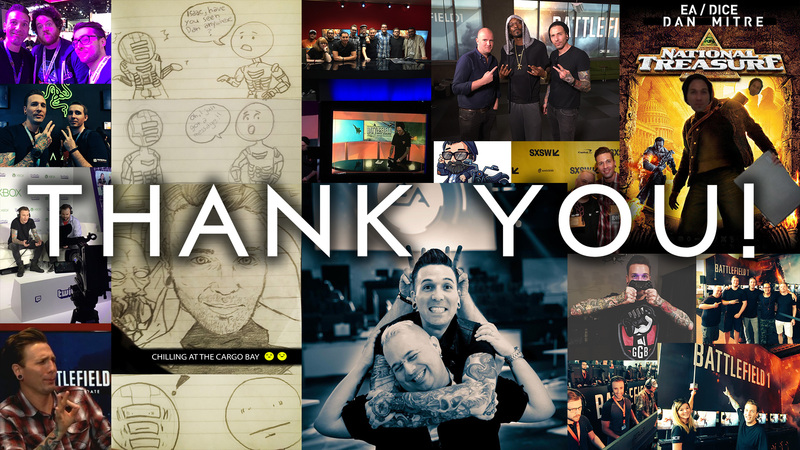 The past 5 years has introduced me to some of the industry’s most talented people, skilled professionals, masters of their own discipline, community members, influencers, YouTubers, streamers, Game Changers… all genuine people that love gaming as much as I do. You should know that if you’ve worked with me in any capacity you’ve impacted my career and social life is a positive way that I am forever grateful for. Over the past several years I got to work within the industry giant that is EA, something I’m wildly proud of. Working on the Battlefield franchise with the world-class developer that is DICE is more than I could have ever imagined. And, lending my expertise to other teams across EA and individuals/teams within the gaming community has fueled some of my most cherished relationships. Thank you for everything you’ve done for me and thank you for pushing me to be a better Community Manager, looking at our games and their states critically, and helping me achieve amazing success alongside celebrating in our victories together. I’m still 100% in the industry as I’m forming and running my own gaming company focused on eSports. So, I’ll be catching you at an upcoming E3 and Gamescom! Feel free to follow me wherever you wish to contact me. Remember, ALWAYS play the [email protected]#king objective! Wow! What an overwhelming response the past 48 hours. Honestly, I was not prepared for such an abundance of support and love from each and every one of my brothers and sisters in gaming. I had to take a moment and soak it all in. You know how to make a grown man’s heart quiver. My Battlefield journey may have ended, but my contribution to the industry will continue in even more massive ways. I’m eager to show you want I’m cooking up next, and very much want all of you to be a part of it! Good luck to you and yours Dan Best wishes. Cheers mate, looking forward to your new pursuits. Well from the 8-member Official Battlefield Core Community Council i would like to wish you the very best in your future endeavors and we would like to award you with this fanmade Community Appreciation dog tag*. I wish you guys posted and interacted with your user base on your official forums more than Reddit. I suppose your warning about EA cutting resources to BFV was a foreshadowing of this, and I'm sure a lot more after their disaster earnings. Stock value took the biggest dive in two decades and now we see people jumping ship. No surprise. Looking forward to see what you'll do next. A gaming company focused on Esports? By now you should know that on these forums we expect more details than that! I have no idea what it is yet but when the time comes, you can already count on my support. I love that qoute if every bf player keeps that in mind. Good luck with the next job! Good luck Dan. Wherever you are going will be lucky to have you mate. How many shares did you sell when the EA stock market crashed before you decided to... *cough* move on from EA? And will you promote historic revisionism in your next degenerate position? And it took three days to recoup that dive… so, now people will join again? Or, maybe people don’t make big decisions about their career, based on the day to day stock price of the company in question. Dan, good luck in your future career! You don't learn, you have been warned previously and simple dont seem to be able to either learn or want to follow rules. As such, I've made the choice for you. Didnt know you really but for sure good luck in the future..